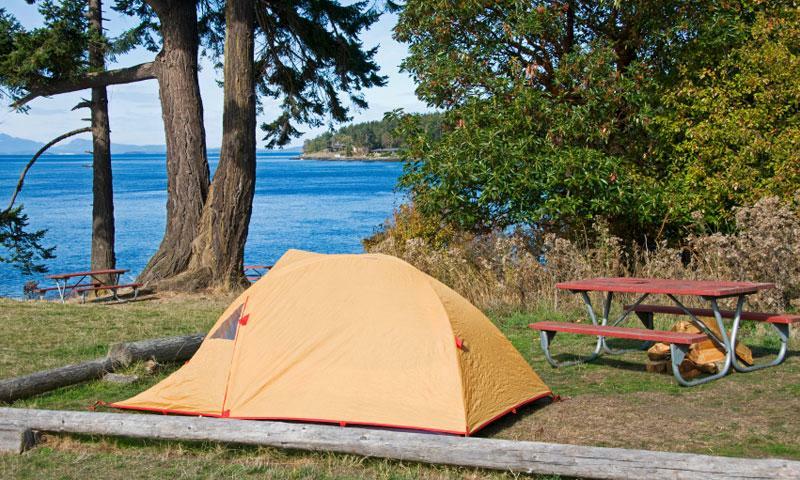 There are many San Juan Islands campgrounds. Many offer beautiful views and water access or quiet tree shaded sites. Try staying at a few different campgrounds is a fun and affordable way to tour the islands. Where can I find great campsites in the San Juan Islands? All the Islands with ferry service have campgrounds. If you have your own boat there are also many park islands throughout the San Juans that have camping. Camping is a fun and affordable way to explore the San Juans. Pack your warm clothes and waterproof tent as it can get chilly and wet even in the summer. This large and well-appointed campground has generously spaced sites dotted through tall evergreen forests. The nearby beach is great for clamming and crabbing. The group sites here are particularly nice and include kitchen shelters. Cost: Camping fees are between $12-$45 for regular sites. Services: The campground has several restrooms but no showers. The Rangers can rent you kayaks and offer good local advice. There is also a playground for kids and several picnic shelters. Phone: The State Park information line can provide you with information and help you arrange a reservation, 360-902-8844. This charming campground has waterfront sites along a sandy beach and plenty of room for kids to run around. It is only a mile from the ferry landing which is great for bike campers and backpackers. Location: From the Ferry Landing head south on the main road and then take a right once you reach the bottom the long hill. Season: This campground is open year round and is surprisingly nice during the mild coastal winter. Cost: Camping fees are $10/person/night. Services: The wonderful sandy beach is a big draw for the campground. There are restrooms, a baseball field, boat launch and picnic shelters as well. Phone: The friendly County Park staff can help you with any questions you might have, 36o-378-8420. This large campground offers the best hiking options. Climb to the summit of Mt. Constitution for amazing views or just stroll through the ancient evergreen forests. The campsites are grouped around two beautiful clear lakes. Location: To reach Moran State Park from Eastsound head out of town on Olga Road and it will lead you right into the Park. Season: This campground is open year round but is busiest in the summer. Cost: Camping fees include a vehicle pass for the duration of your stay. They vary seasonally between about $12-$45 depending on the site. Services: This campground has showers, water and other similar amenities. There is also swimming and boat access to the lake, and a playground for the kids. This lesser known campground has only 11 secluded sites on the southwest shore of Orcas Island. It has a great beach for relaxing or launching your kayak. Location: From Eastsound head east and south on Olga Road. This will lead you right into Olga. From here continue east on Point Lawrence Road, turn right onto Obstruction Pass Road. The Road will take a sharp right and then turn into Merrymac Lane follow this until it runs into Trailhead Road, which leads right into the Park. Season: This campground is open year round. Cost: Camping fees vary seasonally, but are about $12-45 depending on the site. Services: This small campground has some walking trails, beautiful views from a pebble beach, picnic tables and vault toilets. One of the best campgrounds in the San Juans the sites offer great views, water access, and it is a great location for exploring the rest of the Island. Location: Located along the west side of San Juan Island. From Friday Harbor head west on Beaverton Valley Road this will turn into West Valley Road. Take a left on Mitchell Bay Road and another left on West Side Road. The Park will be on your right, on the water. Season: This campground is open year round. It fills up fast in the summer, so make a reservation. Services: This campground is great for kids with plenty of room to play and explore as well as several other nearby parks. There are restrooms, a boat launch and drinking water available here. This small Campground on sparsely populated Shaw Island is a great place to escape the summer crowds and relax on a perfect sandy beach. Location: From the Ferry Landing head inland on Blind Bay Road. This will curve around a large Bay. Take a left onto Squaw Bay Road. The Park will be on your left along Indian Cove Road. Season: The campground is open all year. It can occasionally fill up in the summer. Services: All the sites have fire pits and picnic tables. There are vault toilets and firewood. Drinking water is available during the summer only.